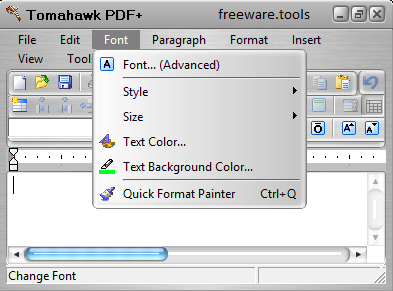 Tomahawk PDF+ is a portable tool and is the freeware version of Tomahawk Gold. The freeware version may not have all the bells and whistles of the full version of Tomahawk Gold but it is still one of the most advanced word processing/PDF creation software packages available for the Windows platform. This comfortably designed program with a familiar interface that's easy to use, allows documents to be produced and saved in a number of formats, including rich text; exported as HTML; or converted to PDF. Given this is a portable tool, no installation is required to use it. Portable Tomahawk PDF+ is a word processing tool that gives you to the possibility of exporting documents to the PDF format. Since this is a portable software, installing it is not necessary. You can simply place Portable Tomahawk PDF+ on a removable drive and directly run its executable file on any computer. What's more important is the fact that your Windows registry items will remain intact. The interface of the word processor is clean and intuitive. You can import documents (e.g. RTF, TXT, HTML) and convert files to the PDF format. Plus, you can use the undo and redo buttons, along with a search and replace functions, run a spellcheck and look up words in a thesaurus. Furthermore, you can remove page breaks, change the case, set up the font, align text, edit bullets and numbering options, enable word wrapping mode, increase or decrease indent, as well as set a single or double line spacing. Moreover, you can set the paragraph background color and fill color, insert files, pictures, delimited tables, horizontal lines, hyperlinks, symbols and page breaks, show non-printing characters, and more. The word processor takes up a low-to-moderate amount of system resources and doesn't cause the system to crash . The text layout is very well maintained in the PDF document. Otherwise, we recommend Portable Tomahawk PDF+ to all users who prefer a straightforward tool that comes with the necessary and suffice elements for word processing.